I used Adam’s super fancy camera and tripod to get some better bird pictures, and found a new guy! Both Cardinals finally showed up together, and even posed for a bit! Mister Blue Jay is a chicken…he won’t go to the feeder if anyone else is there, and he’ll flit around the yard waiting his turn. The top of the umbrella seems to be a favorite spot. This guy has shown up the last two days or so – Grandma, is it a baby Blue Jay? I’ve only seen him when the big blue is there, and he seems to have the same shape beak and head feathers. My camera is on the fritz, even with brand new batteries it shows “low battery” and shuts off. Mom – what kind was the one that you and Paul brought down here? I’m not sure what to do with mine, but I’ll call Kodak customer service later and see if they have any ideas. Which I must preface by saying that there is NO secret meaning 😛 I’ve been itching to do some more cabling, but I don’t want to knit a whole sweater for myself when it is 80 degrees outside. The answer? I saw this book at the LYS on knitting night last week and realized that this was the answer – small, quick-to-knit projects that I can use to whet my appetite for cables and patterns without burning out and without wearing out my credit card. Two balls of superwash worsted weight yarn are $10, which will make an adorable cabled sweater with enough left over for booties and a cap 🙂 I’ll either be very prepared some day, or (more likely) have a bunch of pre-made gifts for when my friends start having babies. And it’s FAST! I’m on light duty at work, which can’t start until Monday, so I have tonight and tomorrow off. I’m falling apart – I had to leave work early today because of shoulder pain (the left one this time, as opposed to the right one which I hurt last year and which kept me out of work for a MONTH). I’m starting to get really tired of being hurt and broken and sore. I’m too young for this! 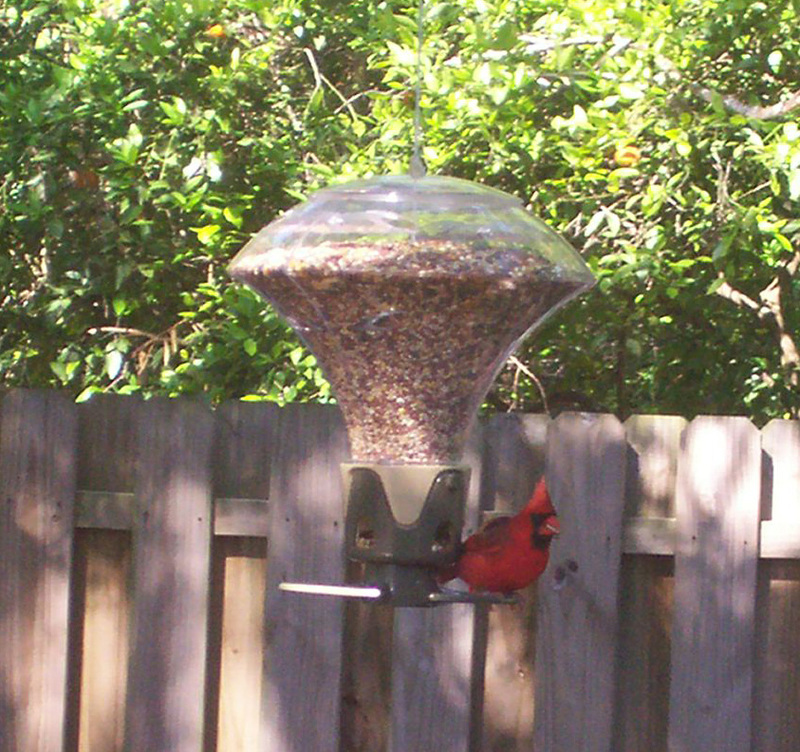 Mrs Cardinal is still blurry…camera shy perhaps? Day off tomorrow, which = knitting. Yay! Last week while Mom and Paul were here I thought it would be neat to put up a hummingbird feeder and see if any showed up. I figured that there wasn’t a lot of chance of actually seeing them, but decided to give it a go anyway. Since I didn’t have much hope I bought a $3.99 feeder (yeah, I’m cheap) and hung it by our living room window. Well yesterday (four days later) I saw one! In the middle of the day! We had the sliding doors open and the feeder was right outside the screen, so when I yelled “ADAM! IT’S A HUMMINGBIRD!” he got a little freaked out and flew away. Didn’t see him anymore yesterday, but this morning he’s come back three times in the last hour! (I’m assuming its the same one, since I haven’t seen more than one at a time.) I moved the feeder to a shepherd’s crook hook in the yard, hanging next to a basket of peony-style flowers, so that they won’t crash into the glass (and so I can see better from the kitchen too). I also went out yesterday and got a regular bird feeder – after spotting all kinds of birds randomly around the yard I wanted to try a feeder. I splurged on a “squirrel proof” feeder because the squirrels around here are crazy, and hung it out in the backyard over a tree limb. I didn’t see any birds last night, but it was pretty late when I hung the feeder. This morning the first thing I did was go open the living room blinds to see if there were any birds, and a male cardinal flew right up and started eating! Then his lady friend cardinal came over and they took turns eating for about ten minutes! There was a Blue Jay flying from perch to perch around our yard waiting for his turn, but he didn’t seem to want to eat with the cardinals and he ended up flying off without eating. That’s all we’ve seen so far, but I didn’t think we’d see anything so fast! I tried getting pictures of the hummingbird and the female cardinal, but I’m still trying to mess with the zoom on my camera and they didn’t want to sit still for that long 🙂 Never a dull moment at this house, that’s for sure! Oh yeah, and we got the front spigot working! The handle is broken off, but Adam bought an extender piece at Home Depot with it’s own switch and used a wrench to turn the broken spigot on, so now we have a working one 🙂 We spent yesterday mowing and weed-whacking the front and side yards and it looks SO much better. Mom – the weed whacker is almost as fun as the lopper! Next project – pool is going OUT! Just two more weeks (I hope). I’ve been slowly identifying the plants in my backyard, and I think i have this one figured out. I’m pretty sure its a heliconia psitticorum (bird-of-paradise lookalike), and I’m not sure exactly how to take care of it. This picture was taken in early December when we were looking at the house and the plant was full of flowers for about two months; now there are few flowers and many of the leaves are yellow at the ends. I’ll have to do some more research. I raided the garden for lettuce and spinach for some home-grown salad, and used Johan’s recipe to make some yummy pasta sauce. If I had thought ahead I could have made pasta too 😛 The secret to Johan’s sauce (ever since they discontinued the “spaghetti sauce seasoning” spice) is apparently Old Bay. It doesn’t taste quite the same but its pretty good. I pruned the basil in the garden yesterday so I didn’t want to pull off any new leaves tonight, but next time I make the sauce I’ll add some fresh basil as well. I’m officially on a gardening kick. Hopefully this weekend we’ll take the pool out (which reminds me, I should call tomorrow and schedule the dirt delivery) which means that soon we can put in a LAWN and plants! Adam wants to cover the fence in the back so we don’t have to look at it, so I’m thinking of some climbing roses or clematis. Roses do make me a little nervous (don’t want to go too crazy right out of the gate) but a couple crepe myrtle could look nice too. I was never a big gardener up north (no garden and too cold) but I do miss northern plants, and roses would be a nice touch. I could just go with bouganvillea (they grow like weeds), but they are kind of thorny nasty plants and need a lot of pruning. Hmmm. As for the veggie garden, I think I’m going to devote one bed to strawberries – Adam and I both love them, and I wouldn’t have to drag them out and replant new stuff there every season. The other bed will stay a rotating bed. Next up in there, carrots and summer lettuce, with some sunflowers thrown in against the fence. And maybe corn. Man, it’s hard to decide! Yesterday we went to Lake Tarpon (Chestnut park) and walked around. We saw lots of wildlife – squirrels(I think Staffan took a picture of every squirrel in the park – and for the record, they look exactly the same as the squirrels he sees every day in New York), birds, a brave rabbit, and even some gators! Mom had a great post with tons of pictures yesterday on her blog. Last night we hung out, relaxed, enjoyed the yard, and all watched a movie. There was a butterfly garden outside that was very cool, but by then we were STARVING and it was getting crowded, so we headed for home. Fun day, and Staffan seemed to really like it (of course now he’s back in front of the computer, but what can you do). I’m really getting used to this vacation/relaxing thing!